In 1991 a futuristic racing game called F-Zero hit screens all over the world, it was released as a launch title for the Super Nintendo Entertainment System and went on to sell over a million copies worldwide. Also of note, the game was produced by the legendary Shigeru Miyamoto. The setting is the far-flung future year of 2560, where bored billionaires of the time have created a new and dangerous form of sporting entertainment to gamble their vast fortunes over. These races take place at breakneck speeds over looped tracks suspended high over the cities, in the desert and other perilous locales. Every track also has its own hazards and respite areas, including plasma barriers, jump ramps and forked pathways. F-Zero features a small cast of unique playable characters, each racer has their own distinct hovercar with different attributes (advantages and disadvantages) of handling, acceleration and top speed. Arguably the protagonist of F-Zero is Captain Falcon. Nintendo originally intended Captain Falcon to be a flagship character for the SNES console era, but that never came to fruition and the honor went to Super Mario instead. That said, our beloved Captain is still one of the more recognised personas in the Nintendo universe. Included in the game's box was an eight page comic, detailing one storyline of racing and bounty hunting. Using 'Mode 7' graphics technology, F-Zero was unlike anything that had been seen up until that point and garnered enough popularity to spawn several sequels over the next few generations of consoles. 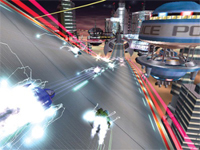 F-Zero was added to the Wii's Virtual Console service in November 2006. The next installment in the series was F-Zero X on the Nintendo 64, which came out seven years later in 1998. The game was well received and garnered praised for its fine-tuned controls, high frame rate and track designs. The only critical point was perhaps the lack of graphical crispness and definition in the textures. This is the first title in the series to use 3D graphics, which could perhaps explain why Nintendo hadn't fully mastered the techniques at the time. The storyline of F-Zero X takes place some time after the original, where the Grand Prix is brought back to life under new rules and regulations after being banned for several years due to its extreme dangers. A slew of new characters and vehicles are introduced, bringing the total up to 30. F-Zero X was the first game to feature the sinister Black Shadow, who is determined to get revenge on Captain Falcon. Several new modes of play were also brought into the mix, including multiplayer racing, which the first game lacked and was criticised for. Another prominent mode is the 'Death Race', in which players have to destroy all other racers on the track as quickly as possible. The 'X Cup' mode generates a series of random tracks and aims to add replay value to the experience. A fun piece of trivia: The first track of the Joker Cup - Rainbow Road, is actually the same Rainbow Road as used in Mario Kart 64, albeit with a change of style to fit in with the F-Zero universe. F-Zero X was included in the Wii's Virtual Console database in June 2007. The latest entry to date is F-Zero GX on the Nintendo GameCube, released in 2003. Undoubtedly the most graphically impressive of the series, the visuals are stunning and the game is widely cited as one of the best racing titles of its time. A frequent talking point and bone of contention is the steep learning curve which could throw novice gamers off. An element of strategy is also present, as players can adjust their vehicle's distribution between acceleration and top speed before a race begins. Even further strategy is brought into play as each hovercar has an energy bar, which gets reduced on collisions, but also can be traded off for speed boosts. F-Zero GX and its arcade counterpart F-Zero AX have the distinction of being the first collaborative work between Nintendo and Sega, who had previously been keen hardware rivals. One of the primary features of GX is the 'story mode', which focuses on Captain Falcon and his racing exploits. Players assume control of the Captain and his Blue Falcon plasma-powered hovercar through nine chapters, tackling a variety of races and missions.